The other title for this post could be ‘Surf Buddies’. 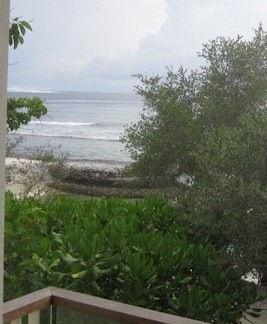 Some Maldives visitors like the utter remoteness of many of the islands. Feeling like you are on a solitary deserted island in the middle of nowhere. While I enjoy that desolate sensation, I also enjoy the little ‘communities’ of the archipelago. Clusters of land bridged by sand spits and shallow lagoons. 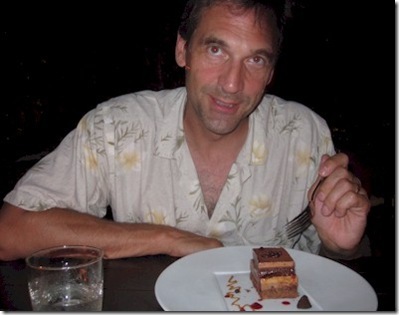 It was one of the first stories Andy Lees intrigued me with when describing the Maldives. He told how when walking around the island he spotted another tiny island offshore. Not too far away and the water seem quite shallow. 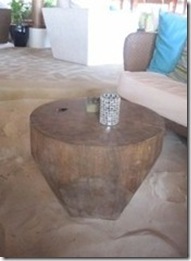 He started walking towards it and before long he was on the other island having waded over from his resort. My twist today is taken from the community of surfing resorts in the spirit of this week’s posts. 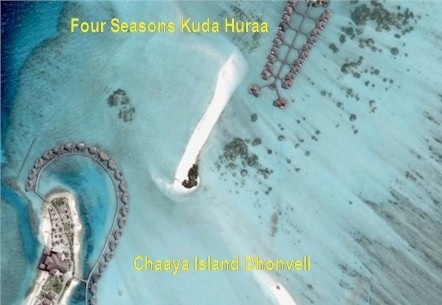 I’ve highlighted close clusters of islands before, but in this case the islands aren’t especially close, but their water villa complexes are – Four Seasons Kuda Huraa and Chaaya Island Dhonveli. As the Bing map above highlights, the two water villas come to within a couple of hundred yards of each other. On top of that, they have a handy little sand spit to provide a bit of a sand bridge for any particularly neighbourly strolls. Mind you, resorts are quite keen that you alert them if you are going to visit their island so spontaneity needs to be kept to a minimum. Their proximity is not that surprising. 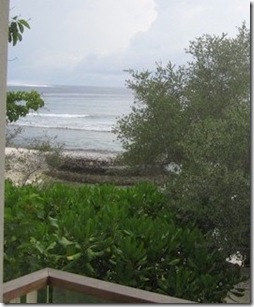 Both are located on a reef plateau which provides both with rich surfing in the vicinity. You don’t have to be a pro to ride the surf in the Maldives. One of the big appeals there is their long, gentle breaks. One of the best beginner breaks is ‘Prewitts Left’ near Anantara. Resident surf instructor Kym Everett explains that it has an “Easy take off and easy ending in a soft area that finishes in deep water…ideal for a someone just starting out.” Like the young lad on the video above taken at Prewitts Left. Unfortunately, the cameraman/instructor needs a bit more practice! 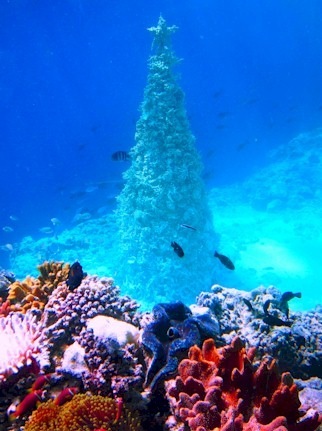 The December holiday season has been packed with all sorts of celebrations from festive Yuletide, big birthdays and even a milestone anniversary for Maldives tourism. The Maldives Marketing & Public Relations Corporation (MMPRC) is celebrating the 40th anniversary of tourism in the Maldives with a special photo competition of nostalgic images capturing the humble beginnings which have grown into a worldwide wonder (see photo below). 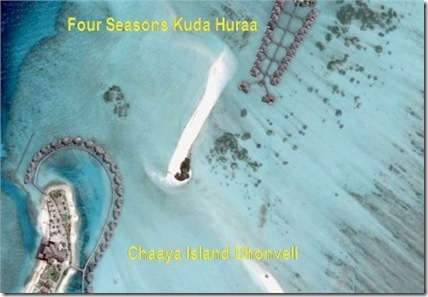 The genesis of it all was the Kurumba resort. 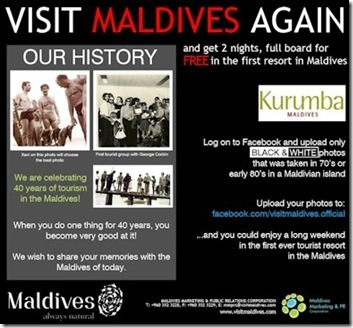 So it was appropriate for Kurumba to play a big part in the celebrations (they are sponsoring the competition with 2 free nights as the prize for the best photo posted). All of that experience and heritage has made Kurumba a favourite for many. Our first stay there, we attended the weekly drinks evening for repeaters and the bar was packed. But the champion repeater of all time is also a Kurumba regular – Mr. Mr. Yamagoshi. 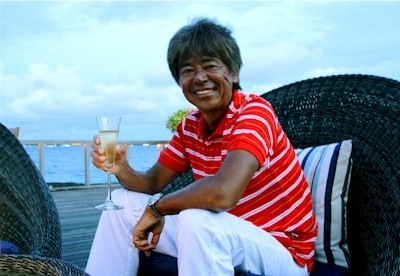 Mr. Yamagoshi has been to Kurumba 64 times! I haven’t even been to my local pub 64 times. The picture above was taken at the Kurumba Beach Bar during an interview he did to mark the ruby anniversary of Maldive tourism. Kurumba: What keeps you coming back?? Rosenquists: Apart from the fact that during the time we lived in The Maldives Kurumba become a second home to us and we know all the staff well, I love the relaxed atmosphere of diving at Kurumba and the reef is good for both of us to snorkel on. K: How many times have you been to Kurumba? R: 64 stays though we did live in Male for a number of years. K: If you had to name one thing that is your favourite, what would it be? Congratulations to all the Maldives Resorts on this milestone anniversary and Kurumba for delighting so many for so long. 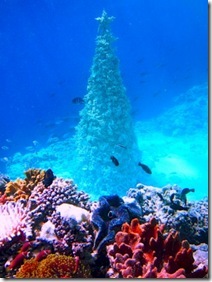 Wee fish you a ‘mer’ eco-ristmas! How lovely are your nudibranchs! Through summer sun and winter sun. How lovely are your nudibranches! Happy Holidays to everyone! Peace on Earth and Goodwill to All. And another Happy Birthday…today to the Emperor of Japan. To celebrate, it’s time for another doff of the kabuto once again to all things Japanese in the Maldives, Adaaran Vadoo. 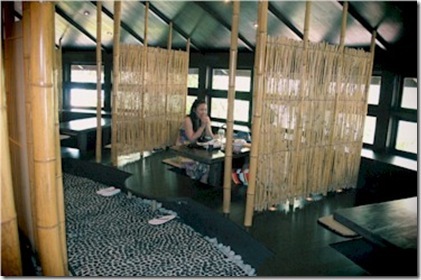 This time, in this season that puts the ‘feast’ into ‘festive’, it is the Kitajima restaurant. 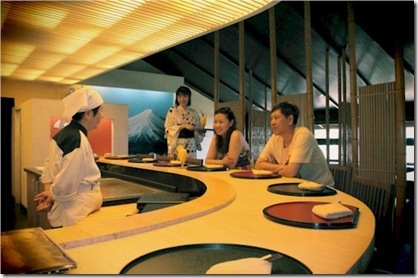 Many resorts feature Japanese fare like sushi and tempura and some even have full fledged Japanese restaurants. But none as extensive and authentic as Kitajima. The materials used in building the restaurant, supplies used in preparing the dishes (except for the hyper-fresh seafood), and the staff straight from Japan (including the manageress who has been there since the opening). Today my companion in all my adventures celebrates the major milestone of her 50th birthday. Lori was the one who was initially responsible for my immersion into all things Maldives. After living in the United Kingdom for nearly a year, we hit the dreary, grey winter months. After many weeks without seeing the sun, Lori confronted me with the ultimatum, “Bruce, either you pay for a tropical holiday or you pay for psychotherapy. Either way you are going to pay, but might I suggest that you might enjoy the tropical holiday more.” My friend Andy Lees insisted that the only place to take her was the Maldives. And the rest was history. On this day, the thing to celebrate is cake. There are a plethora of spectacular chefs in the Maldives so I am typically very hesitant to ascribe any ‘Best of Maldives’ for specific foods. Most of the ‘Best of Dining’ accolades go to distinctive experiences or venues. If I am going to accord a kudos, it needs to be quite a narrow area (like Sheraton Full Moon’s Gazpacho). While I couldn’t whisk her away to the Maldives, I do have special gourmet treats planned for her tonight, including a special chocolate cake which evoked one of the most memorable desserts we ever enjoyed in the Maldives – the W Retreat’s ‘7 Layer Chocolate Cake’. Like Lori’s birthday surprise, the cake was two months in development by Pastry Chef Sanjit Gupta. It mastered that paradox of rich flavours with exceedingly light feel to it. 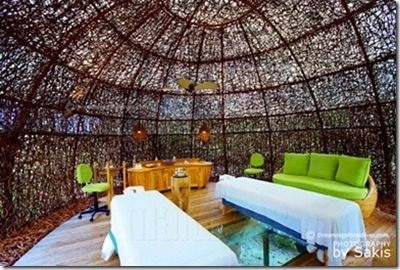 The spa ‘vista’ doesn’t have to be the glorious Maldivian seaside when you have such dazzling design for the spa itself. Six Senses Laamu’s spa stands out not only in the Maldives, but worldwide having recently been nominated for ‘Spa Design of the Year’. Its look is inspired by nature resembling a woven bird’s nest.